The reef stretches south of Tanjung Letuhoh and has some large submerged boulders and pinnacles. Falling tide with a northerly flowing current is the best time to dive here. There are some large coral covered pinnacles at around 30 meters that attract a diverse quantity of fish life. Another big fish dive here with potato cod, napoleon wrasse, trevally, tuna, eagle rays and reef sharks. Just off shore is Nisaleme island that is very exoposed and drops off into deep water very quickly. Watch those down currents. More big pelagics here including dogtooth tuna, rainbow runners and jacks. 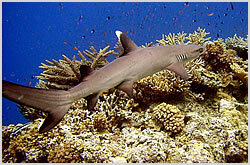 Further north there are a number of other dive sites including Toroletuhoh, Batu Saloka, Tukoh Serikaya and Lohwenci. All of these offer healthy coral and good marine life typical to that found around Komodo island.